Considering the fact that the Eyre Peninsula is known as Australia’s seafood frontier and is home to 1,200 miles (2,000 km) of coastline, it’s little surprise that fun begins here with a splash. On the east side of the peninsula, Spencer Gulf offers the chance to swim with great white sharks near the Neptune Islands, beside southern Bluefin tuna and amid a colony of sea lions. On the wild west coast, surfing beaches draw the biggest crowds, but it’s also possible to snorkel with bottlenose dolphins and observe both southern right and humpbacks whales. On the dinner table, expect local southern Bluefin tuna, yellow kingfish, Pacific oysters, abalone, mussels and blue-swimmer crabs alongside regional wines. It’s even possible to take the culinary experience on the road, along the seafood and aquaculture scenic drive route from Whyalla to Ceduna. Conservation and national parks stretch the length of the peninsula, too, beginning with Gawler Ranges National Park in the north and stretching southward to Lincoln National Park. Kangaroos, wallabies and emus roam the bush lands in between, and encounters with these wonderful animals is the rule rather than exception when exploring this outback-like wilderness by 4WD or bicycle. Hikers will find plenty of options, ranging from the half-mile Yangie Lookout Walk in Coffin Bay National Park to the 58-mile (93-km) Investigator Trail in Lincoln National Park. The Eyre Peninsula is a full day’s drive from Adelaide, but short daily flights connect Southern Australia’s capital to regional airports in Port Lincoln, Whyalla and Ceduna. 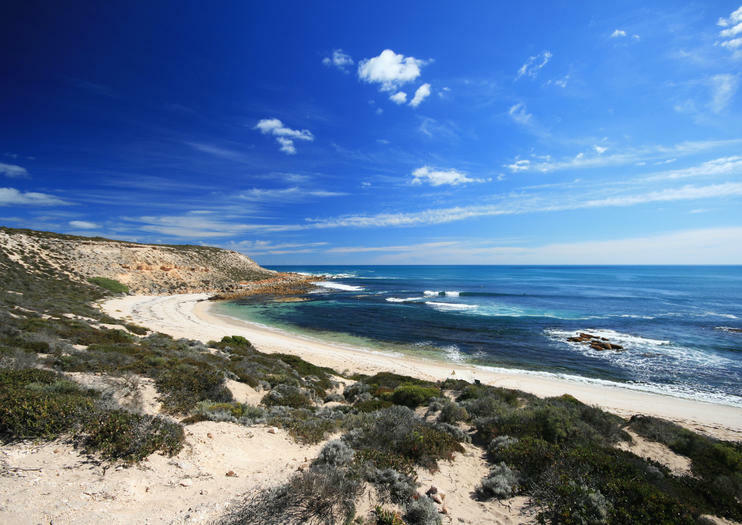 Escape from it all on this back-to-nature 6-day camping trip from Adelaide and discover the beautiful beaches and wild forests of the Eyre Peninsula. Your action-packed itinerary includes the chance to try sandboarding at the Lake Newland dunes; spot kangaroos, wombats and emus on a nocturnal nature walk. Adrenaline junkies can even brave a shark cage dive (extra cost). This small-group tour has a maximum of 18 people and includes camping accommodation and all meals.